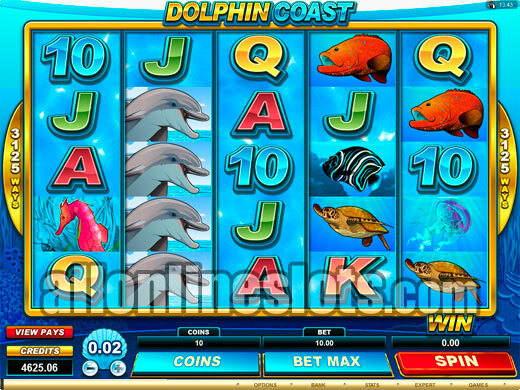 Dolphin Coast is a Microgaming slot machine that uses a rare 5 by 5 symbol layout with a 3125 Ways format. The game offers some of the biggest jackpots in the Microgaming range with a top prize on the free spins of a massive 7,500,000 coins! 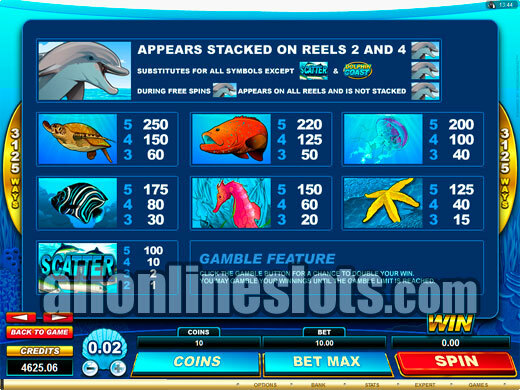 Dolphin Coast is a 3125 Ways slot machine from Microgaming. It joins a long list of slot machines that have had Dolphins as a theme with Aristocrats Dolphin Treasure probably being the most famous. Dolphin Coast stands out from the pod with a rare 5x5 symbol layout and one of the biggest non progressive jackpots online. Due to the size of the jackpots, Microgaming have limited the coin sizes to 0.01 and 0.02 although you may find a 0.05 version at some casinos. While the game has 3125 ways you so not bet on individual lines. Instead a bet of 50 coins activates all ways. You can choose to bet up to 10 coins per way for a 500 coin max bet. On the base game you have stacked wild dolphins on the 2nd and 4th reels. Obviously you cannot get five wilds but the stacked symbols are the key to the biggest wins on the base game as two reels of stacked symbols make every five of a kind pay hundreds of times. * The top paying symbol on Dolphin Coast is the Turtle which pays 250 coins. While this might seem like a tiny jackpot the fact that you can hit the combination on hundreds of lines increases the pay to a very tidy win. After the top pay the red fish pay 220 for five, the jellyfish pay 200 and the black striped fish pays 175. In addition to the fish symbols you also have the common A, K, Q J, 10 and 9 symbols which make up the lower pays. Dolphin Coast has a reel based feature called the Wild Dolphin Bonus. Whenever a Dolphin Coast logo appears on the middle reel the bonus is activated. You then get to pick one of three dolphins to reveal a multiplier of X2, X3 or X4. When you combine the highest Wild Dolphin multiplier with two reels of stacked wilds and turtles on the remaining reels you win the base games highest jackpot of a huge 800,000 coins or 8,000 if you are playing the one cent version. 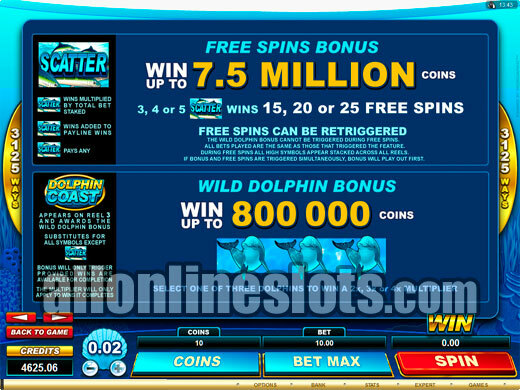 Dolphin Coast also has a free spins bonus. To activate the free games you need to get 3, 4 or 5 of the Scatter symbols. You then win 15, 20 or 25 free games respectively. During the free games you get a whole new set of reels where the stacked wilds are gone and replaced with all symbols (except wilds) appearing stacked. This means you can get a whole screen of the highest paying Turtle symbols which pays a staggering 7,500,000 coins or 75,000 at the one cent coin size. 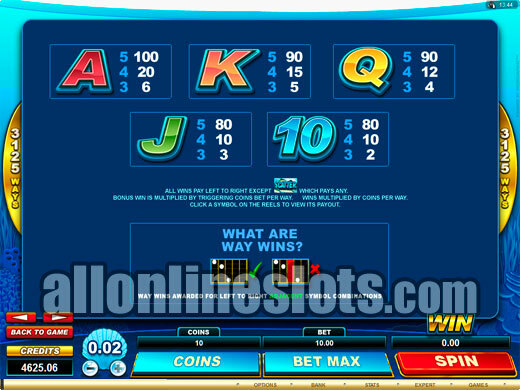 Even if you do not hit the highest pay there are stacks of big winning chances on the free games. 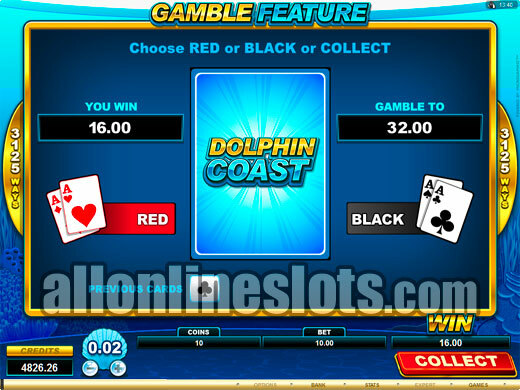 Finally, Dolphin Coast has a red or black gamble option where you can double up your winnings on the reels. You can keep doubling until you reach the gamble limit which varies from casino to casino. We always like to see something a bit different and Dolphin Coast delivers on this. First you have over 3,000 ways to win on every spin. Second you have stacked wilds and a multiplier feature on the base game and third you have massive jackpots during the free spins. Overall, Dolphin Coast ticks all of the boxes when we look for a great video slot.